A 60-year-old male presented with progressively severe left facial pain with 8 years of onset. The pain was stabbing on quality and occurred in paroxysmal attacks in V2 and V3 trigeminal territories with duration of approximately 30 s–1 min. He was previously healthy and his family history was unremarkable. The neurological examination showed facial trigger points in the left maxillary region. Furthermore, he said that brushing teeth and shaving triggered pain. Laboratorial tests were within the normal limits. A noncontrast head computed tomography was requested [Figure 1]. Figure 1: Noncontrast cranial computed tomography scan. What are the findings in the noncontrast cranial computed tomography scan? What is the most likely diagnosis taking into account this clinical scenario? What is the treatment of this condition? Which differential diagnoses are possible? Trigeminal neuralgia secondary to basilar dolichoectasia. 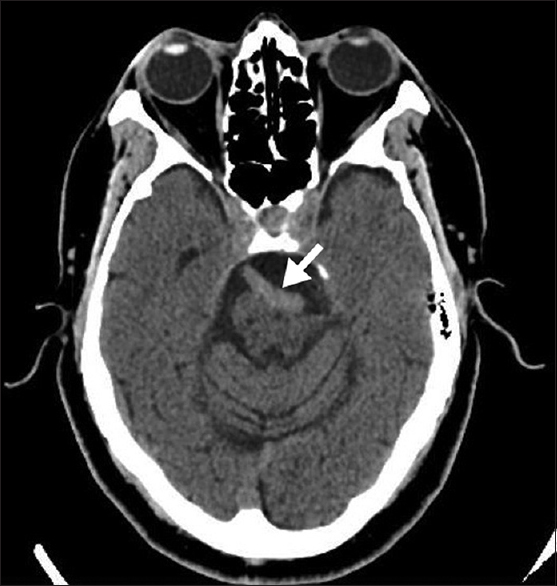 Figure 2: Arrows point to the basilar artery dolichoectasia. Trigeminal neuralgia is characterized by sudden paroxysms of neuropathic pain in the distribution of one or more divisions of the trigeminal nerve. 4. 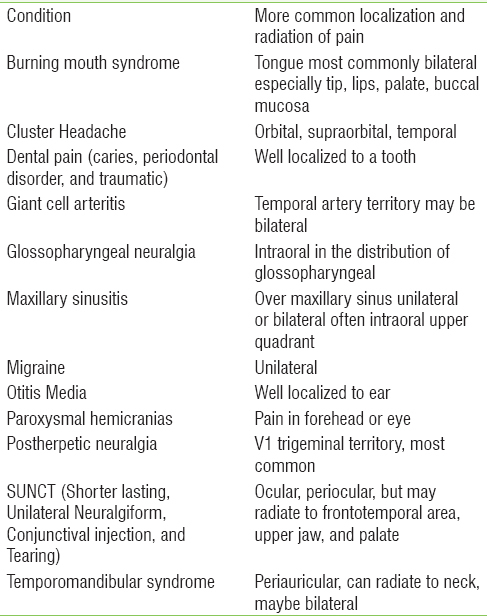 In [Table 2], the differential diagnosis is based on the localization of the pain. Love S, Coakham HB. Trigeminal neuralgia: Pathology and pathogenesis. Brain 2001;124:2347-60. Zakrzewska JM. 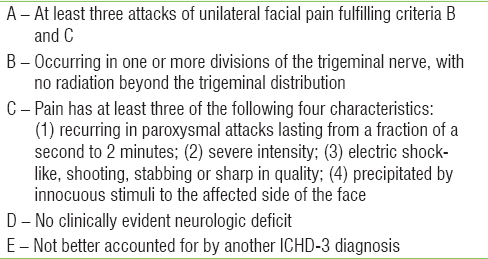 Differential diagnosis of facial pain and guidelines for management. Br J Anaesth 2013;111:95-104. Headache Classification Committee of the International Headache Society (IHS). The international classification of headache disorders, 3rd edition (beta version). Cephalalgia 2013;33:629-808. Gronseth G, Cruccu G, Alksne J, Argoff C, Brainin M, Burchiel K, et al. Practice parameter: The diagnostic evaluation and treatment of trigeminal neuralgia (an evidence-based review): Report of the quality standards subcommittee of the american academy of neurology and the european federation of neurological societies. Neurology 2008;71:1183-90.